Design of the brand and packaging identity of all the products, both current and under development, for the purpose of supporting the growth strategy in the distribution and renown of a brand which operates in the yoghurts and dairy products market. The aim was to reflect the brand’s premium positioning based on offering an outstanding and superior organoleptic pleasure resulting from a process that respects the original handcrafted production. With products that respond to both very traditional and highly innovative profiles, the Pastoret language of quality is rooted in continuing to apply production practices appropriate to its origin as a cottage industry. Although growth often causes the abandonment of these practices in favour of greater productivity and costs saving, at Pastoret the desire to grow takes just the opposite line: at all costs maintaining special production that ensures the differentiation of a superior culinary value. Transferred to the design, we sought to get across the pleasure that is created by something produced with the utmost handcrafted care. The visual path chosen to express this is not the usual one in food products, in which handcrafted production is normally made credible from the highly traditional aspect, often recreating a coarse and antique feel, even a “village” feel. On the contrary, the idea of craftsmanship we wanted to get across was that of simply conceiving and doing things conscientiously for the sole purpose of giving us great satisfaction, whether it is dessert, a good made-to-measure suit or a car with superior performance or finishes. When the name and graphics of a brand transmit a large amount of information about it, it must be ensured that the profile that creates its perception in the mind of the consumer is completely coherent with the positioning objectives. Otherwise communicating a great deal is dysfunctional. This was the situation that arose with the long brand name “El Pastoret de la Segarra” (see image 2) which appeared associated with a naïve illustration of the person in question, a little shepherd. Complex and clumsy at the same time, overall the brand name evoked perceptions that in no way fitted the reality of the brand and even less what it wanted to be in the future. The most relevant connotations that the logo put over, such as freshness and naturalness, were expressed from the packaging, thus lightening the overload of communication from the brand name. Here the decision to opt for an exclusively typographic brand name was vital, discarding any illustration which, whether through what it expressed or due to the style in which it was done, could polarise tastes and lose validity over time. The brand bane was shortened by routinely using: “Pastoret”. Two of the brand’s original credentials were used alongside it: “La Segarra”, the agricultural and livestock region where it comes from, and “Familia Pont” which relates to the company’s family and artisan roots, as well as the personal commitment of those in charge to always offer high quality. Best Packaging Gold Award 2012. 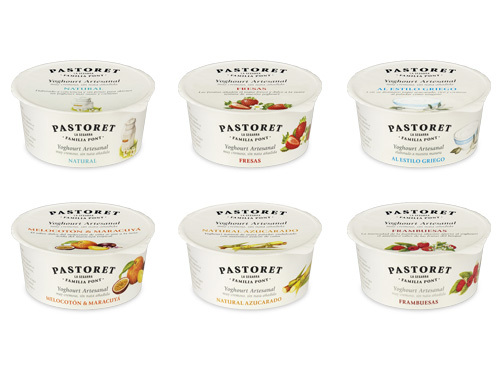 In Pastoret’s commitment to differentiation, the introduction of a new and unusual 500g yoghurt format was proposed. As with the 125 g format, it was decided to use a distinctive waxed cardboard packaging which, in this case, included a lid in the same material. 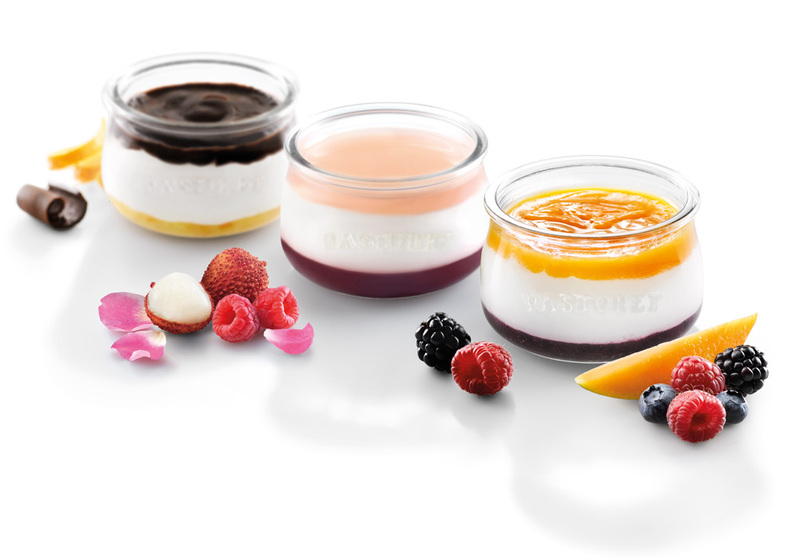 In particular, the height of this format permits an elegant and balanced vertical arrangement, which begins with the brand name and closes at its base with the attractive illustrations created for the five varieties on offer - natural yoghurt, sugared yoghurt, strawberry, peach-passion fruit and raspberry. The final aim pursued was for both the painstaking production process and the promise of quality and pleasure when sampling these yoghurts to be inferred and made credible just by looking at their packaging. Or what is the same, to achieve a highly effective impact on consumers that leads them to confirm the good initial impression by purchasing the product. The reactions aroused to date in current and potential customers, in the distribution channels and in the domestic and international markets, seem to confirm that this has been achieved beyond all expectations. 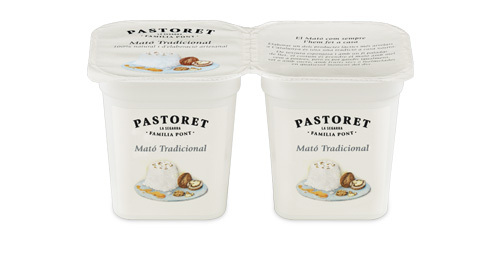 “Mató” is a traditional Catalan cottage cheese normally eaten as a dessert, soaked in honey and accompanied by nuts. 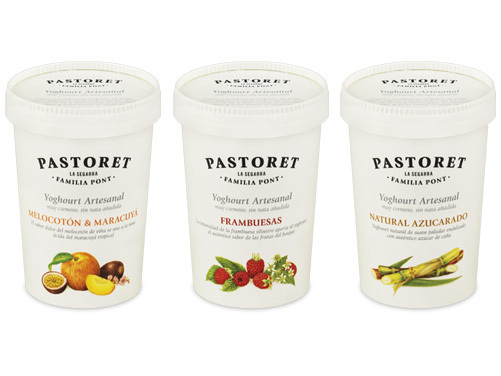 Pastoret’s new image converts a product with an efficient packaging but also very common into something much more personal, able to transmit the simplicity, care and freshness of craftsmanship. Not surprisingly, the excellent quality and the taste of the “mató” that Pastoret has traditionally produced constitutes one of the company’s foundations for growth. The visual tenet of yoghurts is defined by the great players of the market in cold food shelves. With their plastic moulded trays, their labelling shows a great deployment of colours, shapes and messages following the impact of brands and sub-brands and of the identification of the variety, a distinction that becomes increasingly complex with the line extensions. As a field of play removed from the interests of a brand like Pastoret, we wanted to get away from this visual code and establish an own code capable of communicating greater value. It was clear that up to that point the Pastoret 125 g yoghurts had not done this (see image 3) Prior to the new design, the visual chaos of their appearance was, if anything, accentuated by concentrating the information in a top-lid, maintaining the same white plastic container for all the varieties. To begin with, the plastic was abandoned in favour of using a waxed cardboard tub, similar to those used for ice creams. The packaging permitted personalised decoration for each flavour by creating illustrations with great quality of production. As regards the design, in contrast to the visual noise that dominates the shelves, the Pastoret products succeed in creating their own qualitative, simple and quiet space. The painstaking, conscientious preparation, the cleanness and the freshness make up a generalised perception of looking at a product of a different quality - superior, intended only for the consumer’s pleasure and enjoyment. 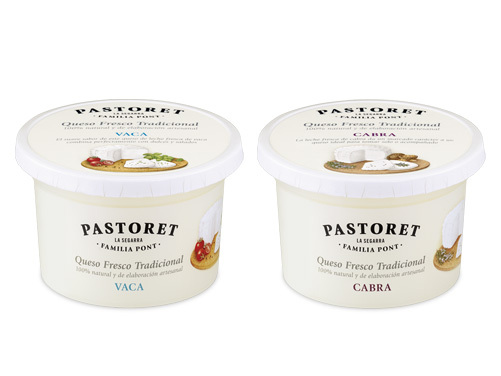 The fresh cow and goat milk cheeses are currently one of the most prevalent of Pastoret’s specialities on the mass distribution cold food shelves. Located together with a competition whose appearance mostly responds to the impact tenets of high consumption, their contained and neat style, common to Pastoret products, establishes their own space. The presence of the Pastoret fresh cheeses thus stands out and is differentiated, while it communicates a highly personal perception of superior quality. 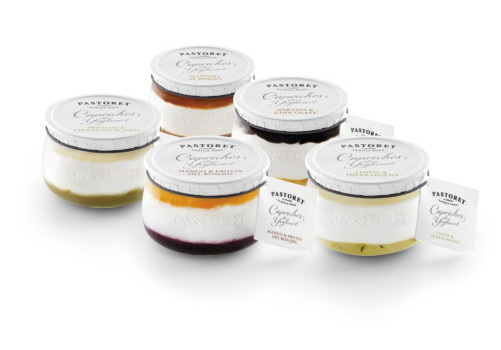 The success of the response to the launching of the Pastoret range under the name of “Caprichos de Yoghourt” (Yoghurt Whims) was key to defining the general direction the company was going to take. Among other consequences, it contributed to defining the positioning which has led to the new design of the brand and of all the products by Lateral Branding. With eight very attractive varieties, each “Capricho” consists of a creamy, Greek-style yoghurt between two layers of flavours, creating combinations as original and evocative as, for example, a yoghurt with a base of pistachio sauce and finished off with a white chocolate cream. The initial success of the "Caprichos" was undoubtedly due to the product’s intrinsic quality, as the other factors did not help in this regard. Suffice it to say that they were launched in plastic packaging and with a general appearance inconsistent with a sophisticated and highly priced product profile which had been devised for being served in restaurants. However, the inappropriateness of the appearance did not prevent the product from gaining the esteem of a consumer who found it in gourmet retail stores such as delicatessens, select cooked meat stores, etc. The development of a new volume for a personal glass pot was the essential step towards ennobling the product’s appearance and not impeding its potential to reach a wider selective distribution, including the catering industry. As an individually sold product, we did not want to conceal the visual attraction of a product with three layers through the glass. All the information on each “Capricho” is concentrated in a booklet tied around the small jar with string. A treatment which emphasises the qualitative and simple line of Pastoret packaging and which seeks to induce consumers to try a product which, when doing so, is so good that it is not forgotten. Packaging redesign to make the brand’s image profile more effective competitively with consumers while simplifying and making the label more sustainable, in line with the environmental sensitivity that has developed out of Raimat’s long use of integrated production. Differentiating the different brand lines, expressing specific values and establishing a clear value hierarchy among them. BRINGING REALITY AND POSITIONING CLOSER TOGETHER. 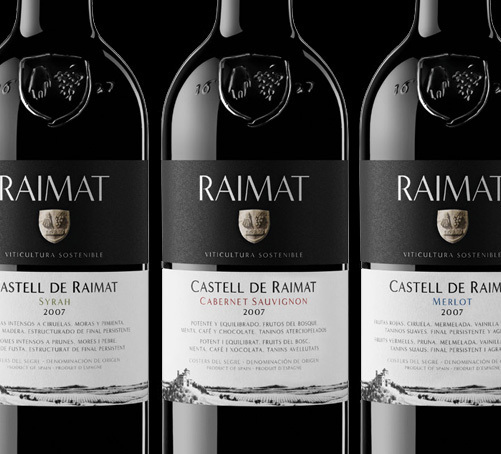 The redesign of Raimat’s extensive line of wines had to overcome the gap in brand perception, both in the domestic market and other export markets where the brand is particularly important. The difficulty lay in more clearly reflecting the values of the brand’s origins and traditions in a way that didn’t break from the previous design, as the packaging had already undergone significant graphic modifications over a short time period. Nor was the previous plastic label in line with the decision to capitalize on decades of integrated production, which means this element should also be more austere and sustainable. Maintaining the dominant black and white color scheme on the label was the main resource in ensuring visual continuity. The new label better expresses tradition, the value of Raimat’s historical and geographical origin, without sacrificing its modern cleanliness, all the while reinforcing the brand’s quality perception, technological capabilities and innovative sprit. The design for Raimat’s most well known line, in both domestic and foreign markets, establishes the brand’s visual personality by introducing a two-tone double label that is also used in the rest of the wines (the varietals, special blends and organic wines). It also marks the structure for the other brands and claims: Raimat on the upper label and the sub-brand for the product line and the varietal on the lower label. This execution is part of the global project Raimat. 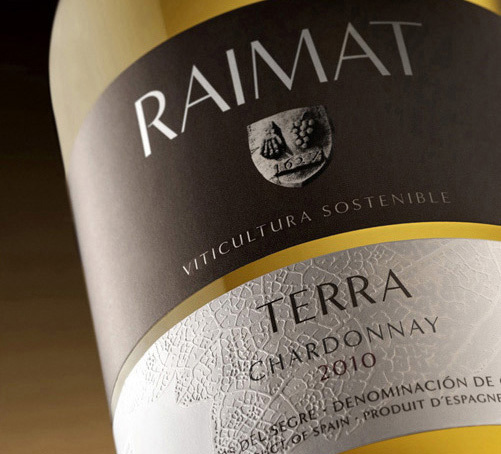 Raimat Terra groups the future line of Raimat wines born from the winery’s certification as an organic vineyard, as they use no agrochemical products. Reflecting these same ideals, the packaging uses environmentally friendly materials: a lighter bottle, tin capsules printed with water-soluble ink, and a natural cork stopper, as well as eco-friendly labels. For the Raimat Terra wines, the upper label displaying the brand is set apart from the rest of the Raimat wines by changing the black background for a brown tone. The lower, white label shows an embossed grape-leaf vein. 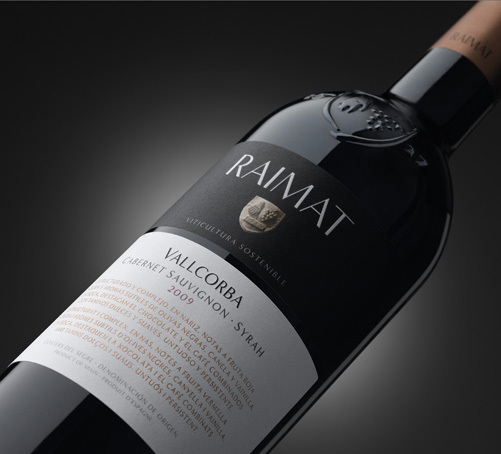 Raimat Vallcorba is an excellently blended wine that shows the high quality this winery is capable of offering. The lower, white label is made larger in size and visual weight in order to display the enological characteristics of the wine in copper-stamped text. One of the characteristics of Raimat’s sparkling wines is their use of varietals not frequently seen in cavas, which is reflected in a unique image on a personalized bottle shape. 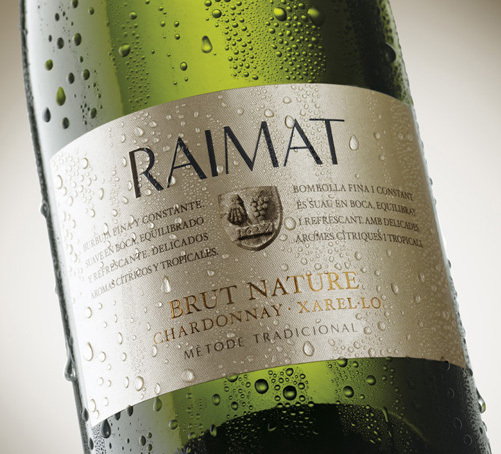 Both aspects change with the new Raimat Brut Nature cava: which proposes a blend of the international Chardonnay varietal and the Xarel·lo, one of the three grapes typically used to make cava, in a traditional bottle. This balance is manifested in the packaging design by striking a balance between the different codes used for Raimat wines and sparkling wines, as well as a compromise between the restraint, visual simplicity and strong chromatic contrast of the Raimat visual identity and the shinier, lighter, brighter and more festive world associated with image of cavas. 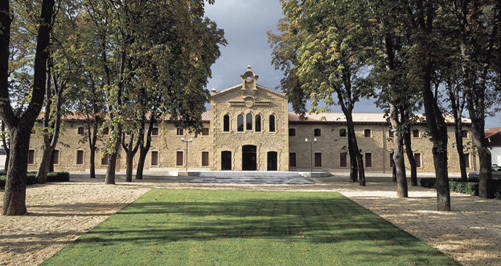 The sub-brand Castell de Raimat groups together varietal wines grown and vinified on the Raimat grounds. According to the visual structure defined by the brand, the lower, white label displays all the specific information. This includes brief tasting notes for the wine in question and an illustration of the castle that overlooks the vineyards, reinforcing the brand’s roots in this line. 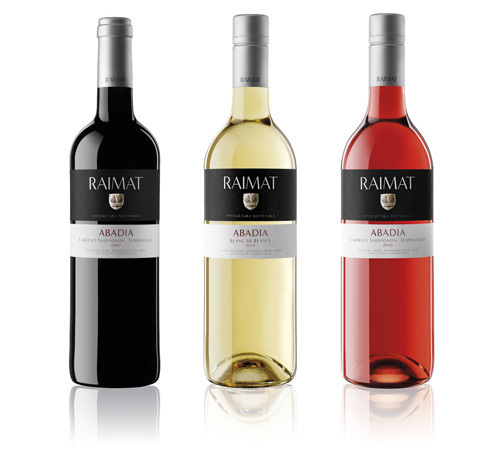 The Raimat Clamor line is made up of three every-day wines: a red, a white and a rosé. 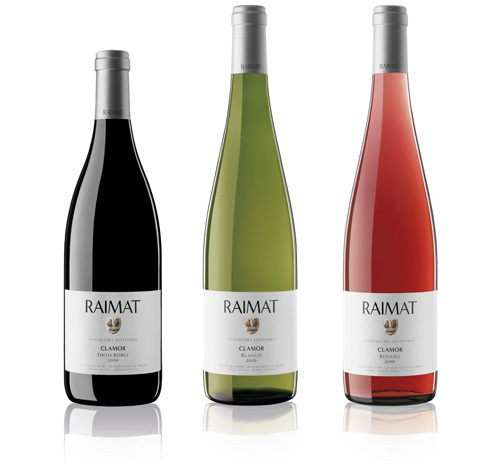 Unlike the double label of the rest of the Raimat wines, these three products from the basic line have only one white paper label that replaces the previous transparent plastic design that didn’t properly reflect the product’s quality. 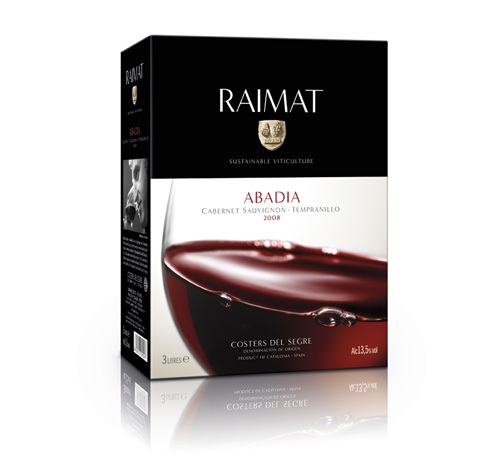 Bag-In-Box is an essential format for some Scandinavian markets in which Raimat, and its Abadia line of wines in particular, are well established, as the demanding consumer insists on good wine for every-day use without giving up the convenient pricing of a more affordable format. 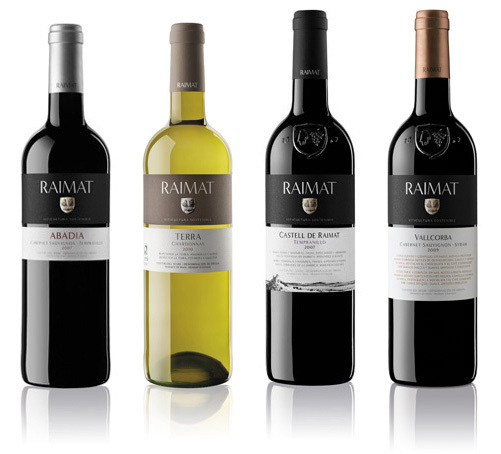 Respecting the characteristic separation of color on the Raimat label, in this format the lower part displays a suggestive close-up photograph of the wine, red or white, in a glass. Packaging redesign and shaping for a new wine. Formulation of concept and graphics to express strong brand positioning and values, ensuring its representative function in moving from a product brand to make Viña Pomal a brand in its own range development. A PAST WITH PROMISE FOR THE FUTURE. 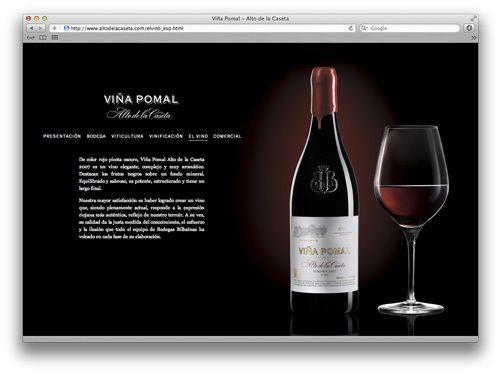 Viña Pomal is one of the most prestigious brands in la Rioja. Well-known for its Viña Pomal Reserva, they entrusted us with redesigning their image for the launch of Viña Pomal Crianza, which was the result of a great harvest and showed great sales potential on the market. In the briefing, the brand’s hundred-year history was to be used to lend credibility to its target positioning of superior quality and prestige for Viña Pomal. There was no lack of facts supporting this: their place among the pioneering elite of winemakers in Rioja Alta, their century of international success and prestige, their valuable heritage of privileged and extensive vineyards surrounding their monumental winery in Haro, etc. However, little of this was left in the previous brand that lacked content: the memory of a traditional Rioja seemed to have lost relevance and interest among consumers. The label didn’t reflect the discourse that the brand deemed essential to recover. The latest redesign had maintained important graphic traits, like the personal Viña Pomal type or the burgundy frame around the label, but the desire to modernize had done away with the rest of the traditional visual traits. They had eliminated elements that explicitly supported the credibility of the brand’s desired positioning. Although Viña Pomal was a classic Rioja in its own right, it had shied away from not only its roots but also from the visual code associated with the Rioja greats; from the classic style of labels filled with historical references. Viña Pomal Reserva and the new Crianza had to recover their visual heritage and exhibit proof of their status as a great brand, with a prestigious past and great projection for the future. As a result, the project evolved towards a redesign that would recover the visual historical credentials of the brand while discarding any negative perception of being antiquated or old-fashioned, which would go against another great truth: the cutting-edge expertise and technology used by the winery. 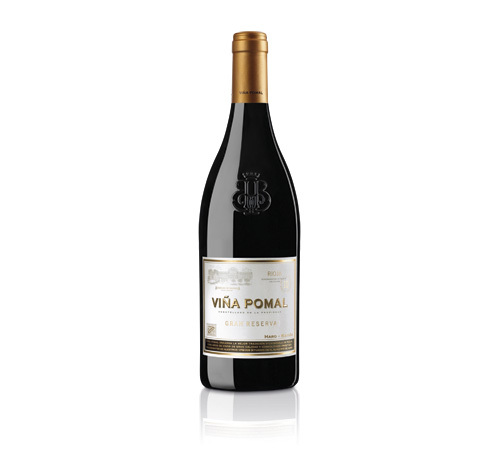 Viña Pomal Alto de la Caseta is a wine that expresses all the knowledge and prestige of this winery. It is the result of an ongoing selection and is only available in a very limited edition. This wine brings together the best of each harvest with the most careful elaboration. Creating Alto de la Caseta has been a challenge for the enological team and its excellence only further enhances and demonstrates the prestige of the Viña Pomal brand. For this reason, Alto de la Caseta had to be inseparable from Viña Pomal in its graphic look and feel. The image had to share an identifiable family feel while expressing the higher status of this product, through a higher quality treatment of the elements that set it apart and by transmitting subtle elegance. For Viña Pomal Alto de la Caseta we created natural, untreated oak boxes containing one or four bottles. The wine brand and that of Bodegas Bilbaínas are branded into the outside of the boxes and inside customers find printed materials in which the enological team presents the wine and explains how it is made. This execution is part of the global project Viña Pomal. Recovering the historic legacy of the Viña Pomal image meant examining the brand’s first labels from the beginning of the 20th century. Here we find the main keys, as these labels establish the traits that set this brand’s graphic style apart from the rest of the small set of great Rioja brands it belongs to. Eschewing the normal distribution of a symbol above the brand aligned along the central axis of the label, for many years Viña Pomal maintained a highly personal structure in which the brand alone occupied the central position, placing the illustration of their emblematic winery on the upper part of the label and off to one side. In this redesign we have returned to this distribution, balancing the space with another highly significant element, the prescriptive tag "Denominación de Origen Calificada Rioja" (Rioja Qualified Designation of Origin) and a seal that expresses another asset that can be capitalized on: the fact that the brand holds the oldest bottler registration number in Spain. The elements surrounding the brand neither detract from its starring role nor make it seem old fashioned, thanks to the way they are treated graphically. For Viña Pomal Reserva, we went back to a larger label that is more appropriate for the brand’s traditional Burgundy bottle. This bottle immediately sets the Reserva apart from the Viña Pomal Crianza, which uses a Bordeaux bottle. The latter has a smaller label that is located on the upper part of the bottle face. However most of the graphic traits of the Reserva are maintained, for example the burgundy frame. 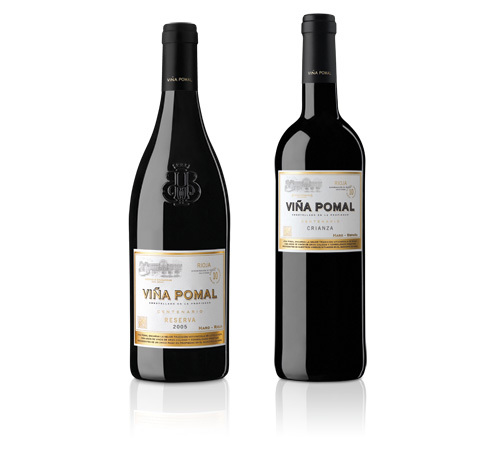 Both of these products are special editions commemorating the 100th anniversary of the Viña Pomal brand, which were destined to appear on wine lists at fine restaurants or in specialized wine shops. 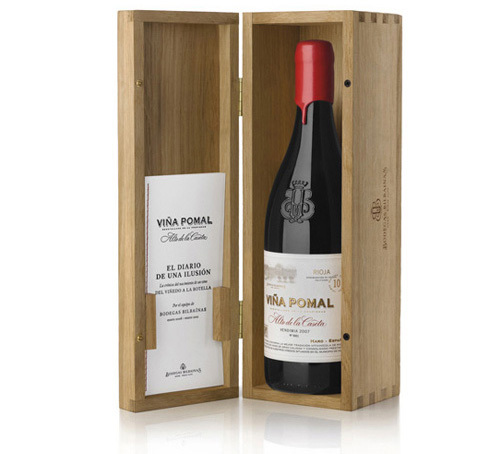 On Viña Pomal Centenario, both the Reserva and the Crianza, the traditional burgundy frame seen on the Viña Pomal labels appears in old gold and the interior of the brand in grey. Redesign of the brand’s Gran Reserva wine to fit with the new image of the Viña Pomal Reserva and Crianza. By maintaining the colors used in the previous presentation, we ensure that it is easily differentiated and quickly recognizable. As it is an extremely limited edition, the Viña Pomal Alto de la Caseta minisite would be the main channel for communications and public relations regarding this wine. However, the wine’s category and Viña Pomal’s own personality led us to shy away from flashy visual effects often seen in digital media. The solution was to focus on the images that tell the wine’s history and explain its winemaking process and, above all, to keep the presentation simple and calm, confident and elegant, as is befitting of the brand.